Born in Staffordshire, England, Susanah (Susan) Helps Goode Swaysgood married George Goode in 1865. The family immigrated to Jamestown, North Dakota in 1880 with seven children. Three more children were born in North Dakota and Susan’s husband died there in 1885. She married John Wesley Swaysgood, a Union Civil War Veteran, in Santa Rosa, California, in 1894. He died two years later in Healdsburg. Susan lived an uncommon life for a female at the turn of the 20th Century. She was an expert poulterer, living in Healdsburg, Pomona, and Indio, before following a married daughter to Rubidoux. 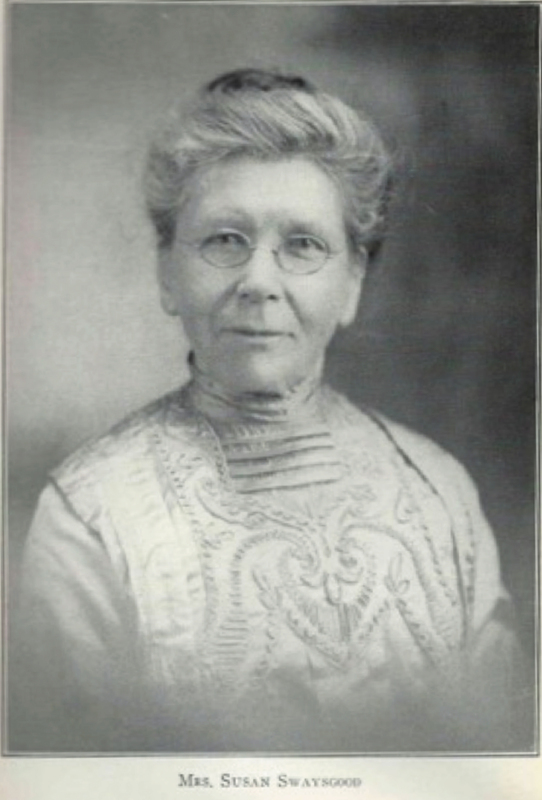 Susan authored the 160-page book California Poultry Practice in 1915. Her book included plain hints for beginners in the rearing, housing, and feeding of poultry; protecting flocks from pests and diseases; and marketing of poultry products. She also authored articles pertaining to ranching. One article in the 1913 Pacific Rural Press explained how to build a solar water heater.